Venkata Siva Gummaluri, PhD Research Scholar, with Dr. Sivarama Krishnan, Assistant Professor and Prof C. Vijayan of the Physics Dept, at IIT Madras. Using techniques devised by C.V. Raman, the team has created a laser using a carrot, which is important because it answers the call for eco-friendly devices. 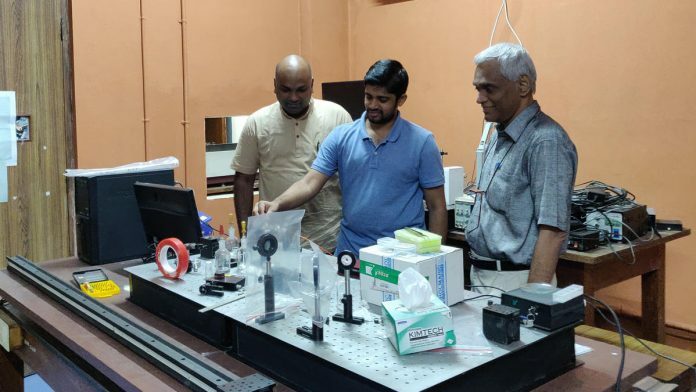 Bengaluru: In a global first, researchers at IIT-Madras have created a bio-friendly laser out of a carrot, using a process known as Raman Random Lasing, which is based on the primary scattering process discovered by Nobel laureate C.V. Raman. The research was undertaken by a team comprising PhD research scholar Venkata Siva Gummaluri, assistant professor Sivarama Krishnan and professor C. Vijayan of IIT-Madras’ Physics Department. As lasers find more and more applications in daily life, the invention is important because it answers the increasing calls to make devices eco-friendly. The team’s results were published in a paper in the Optics Letters journal from the Optical Society of America. Light Amplification by Stimulated Emission of Radiation, or laser, is a highly collated beam of light that can be focused into a microscopic point. The intense energy makes lasers useful for cutting and cauterising. They are used widely in the medical field for precision, and also find widespread use in industries such as textiles, electronics and data storage, nuclear fusions, communications, security systems and scanners, defence, and more. Lasers work on the principle of amplification of light emitted by stimulating electromagnetic sources. A ‘gain medium’ in the design is a material that amplifies resulting signals, resulting in the increase in optical power. The IIT-Madras team utilised carrots as the gain medium, taking advantage of naturally occurring fibrous cellulose, and carotene, a photosynthetic pigment that is the precursor to vitamin A. “We were excited to see lasing in fresh carrots, due to the carotene and cellulose found in them,” said Gummaluri, lead author of the new paper. In a random laser — also called a stochastic laser — a scattering process is used to bounce light randomly between particles to trap light long enough for the medium to amplify it. In conventional lasers, this is achieved by mirrors that reflect the light back and forth, but a turbid medium has been demonstrated to achieve this with much more intensity. The new carrot laser also utilises CW laser pumping, where energy is provided constantly without breaks to amplify the laser, which then produces a continuous stream of output instead of pulses. Such lasers have been built with bio materials in the past, but most such gain media (like dyes) are known to be toxic, requiring excessive care when handling. They have also not been bio-degradable. “Organic bio-pigments like carotenoids found in carrots and porphyrins found in chlorophyll are interesting optically-active media because of their visible light absorption properties,” explained Krishnan. The new laser, apart from being eco-friendly and biodegradable, is also expected to scale in a more cost-effective manner. This report has been updated with a correction. Raman Random Lasing was not discovered by Nobel laureate C.V. Raman. It is founded on the primary scattering process discovered by him.